DynamicAccounting.net: Get the Microsoft Dynamics GP 2013 Table and Field Reference Now! Get the Microsoft Dynamics GP 2013 Table and Field Reference Now! Get the Microsoft Dynamics GP 2013 Table and Field Reference Now! 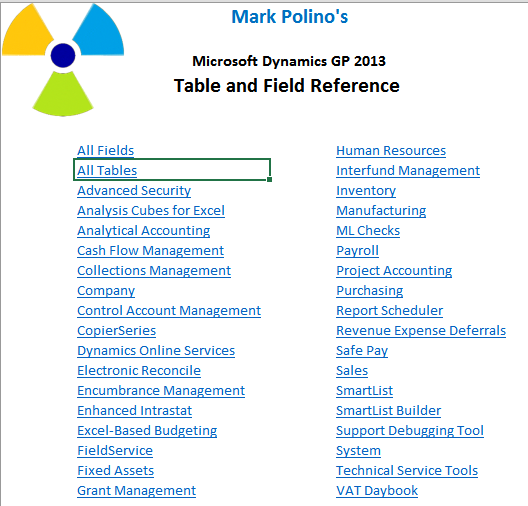 My complete, Excel-based table and field reference is now available for Microsoft Dynamics GP 2013. This is a free resource. Follow this link and download it now. This resource is based on the final, released version, NOT a preview release. It will be couple of days before this is up in the Downloads section so follow the link to get.